Bike Hash Ride 436 was held over the Hari Raya Aidil Fitri long weekend, and the girls and I stayed at the Bintan Lagoon Resort as did most of the hashers. There were around 30 riders and Day One commenced with a loong briefing by Marc and Louise, the wonderful and intrepid couple who spent 8 hours the previous day to lay the hash. We started with open, sun-burnt fire roads and soon meandered through some very nice single tracks with head height "lalang" and other tall grass. The hash had it's fair share of T-checks which managed to keep the group quite intact. Any crocs or exotic bacteria in there? One of the highlights of the day was a river crossing over a submerged log bridge. What seemed to be a fairly simple cross turned out to be quite a long affair as we gingerly tip-toed and fell from the slippery moss-covered logs, the mild current adding another element to test our balance and dexterity. We followed the trail to a long and deserted beach which was a challenge to ride because of the powdery sand, and my drive train was getting chain sucked as well. A quick chain lube later, the bike was good as new as we rendezvoused at a remote kampung for a drink stop. The villagers came out in their Hari Raya finery to gawk at this strange bunch of mad cyclist whilst we rested, traded war stories and slurped on local coconut water and Pocari. We turned around and rode through some of the same trails including the slippery log bridge and arrived at the resort, 3 hours and 45 km later. The girls and I wound down the day with a sumptuous gut-busting steam boat dinner, said good night to the hashers at the beach restaurant and rushed back to our room for a 90 minute Indonesian oil massage ... bliss. Don't forget the electrolytes luv! Day Two was a a shorter 35 km A to B ride through classic tropical trails of coconut plantation, eroded orange-coloured fire tracks and secondary jungles. 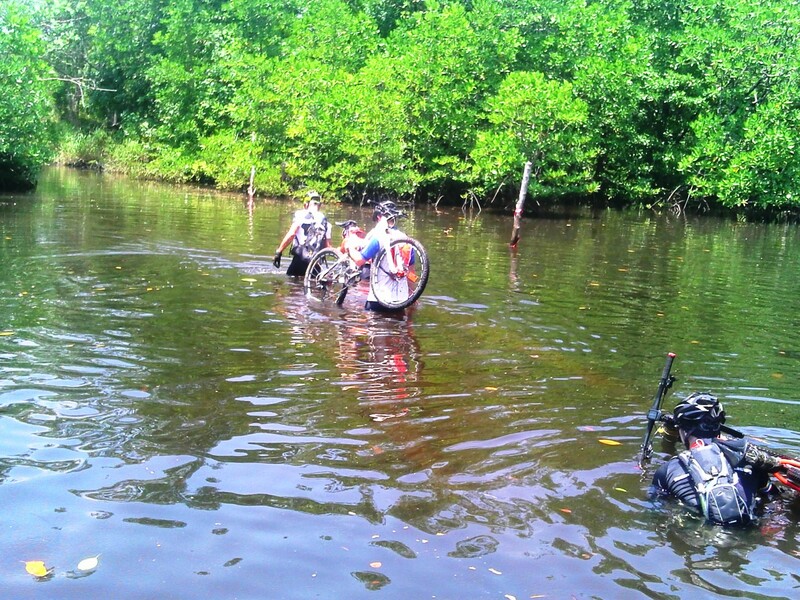 Towards the end, we rode through a golf course and the paper trail led us to the ... sea! Apparently Marc had laid the trail just before the tide came in and we had to carry our bikes chest high in sea water for a good 20 minutes. As the rain clouds started to darken, we just made it to the finish at the Nirwana Gardens Resort and had a soothing soak in the sea. A nice Mee Soto later, and I was racing back to Bintan Lagoon Resort to catch the bus to the ferry terminal, ending yet another excellent hash and outing with friends and family.